When it comes to synergy in their theme parks, Universal Orlando kind of gets it. The theme park takes properties and characters that may have movies coming out, and uses that to their advantage. Case in point, Jurassic World. The fourth movie in the Jurassic Park series, it marks a direct sequel to the series, and hopefully a return to a time when Dinosaurs Roamed the Earth. To prepare for the opening of the movie, the park has taken a key moment and brought it to life with amazing detail. 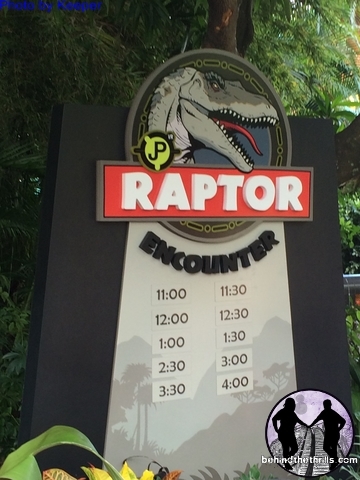 Are you ready for Raptor Encounter? 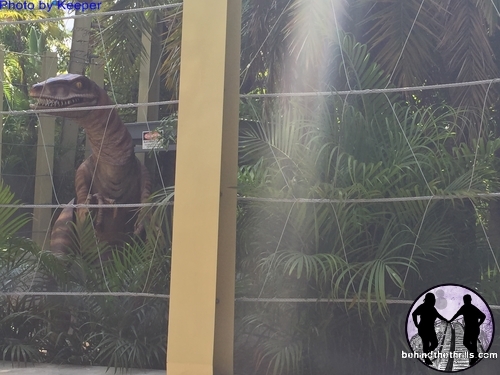 Raptor Encounter is located in the old Triceratops Encounter area of Jurassic Park, at Islands of Adventure. Now, one thing clear, this isn’t a huge attraction. You’re not going to be taken into a care facility, or given a tour. This is merely a photo op with a raptor…but damn is it cool. Guests are given a once in a lifetime opportunity to come face to face with one of the most fearsome, and lethal predators of the age of dinosaurs, the Velociraptor. 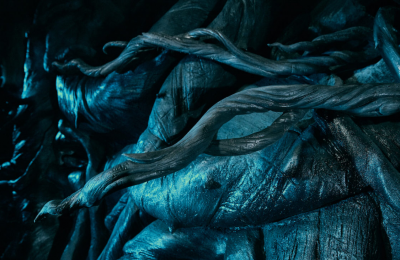 The entire experience feels like it could be ripped directly from the film itself, or from Jurassic World. Guests are brought out in front of a vicious, man eating Raptor, and allowed to take their picture with it. 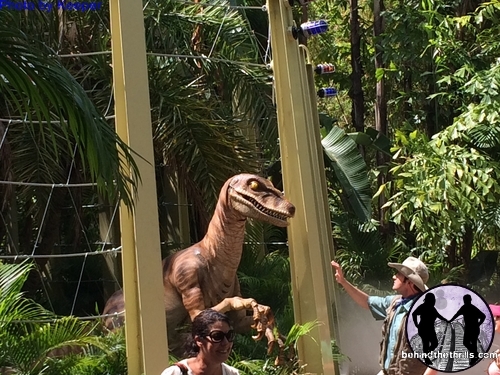 Video-Check out an encounter with a Raptor at Jurassic Park! So, let’s talk about the dynamics of the meet n greet. 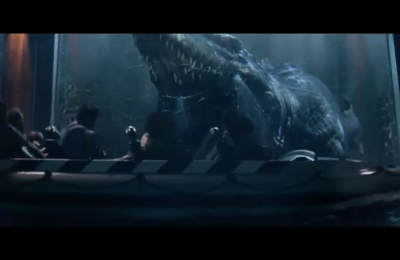 The dinosaur comes out after a brief introduction, and is lead by a “raptor wrangler”. This is something that looks like it’s created by Chris Pratt’s character in Jurassic World. We’ve all seen the photos of the guy riding a motorcycle with raptors. Pretty cool right? The Raptor Wrangler is as much a part of the show as the raptor itself. The raptor is very erratic, but because of the wrangler, his attention is kept, and he’s focused on the wrangler, and not the tasty morsels in front of him. It’s a very cool, and convincing act. How does it work? Well, we’d love to say that it’s an actual raptor…but if that’s what you want to believe, don’t go any further. The raptor is actually a very cool combination of puppet and man in suit. The sound effects are key to the performance, and the character does amazingly keeping in time with the sound effects. The movement is never clunky, or jerky, but very fluid and very lifelike. The way that Universal has tied the new interaction in with the movie is pretty seamless. It’s like the park exists in the world of the movie, and not the other way around. It really draws you in to see these new characters in this setting and light. Jurassic World isn’t the only movie tie in happening this summer at Universal Orlando. 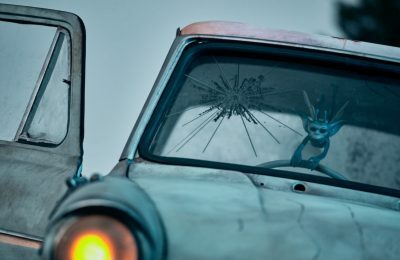 In July, the Minions will be back on the big screen in their very first stand alone film. If you venture to Universal Orlando, guests will be able to go on a Minion Scavenger Hunt at Universal Studios Florida. It’s going to be a huge summer at Universal Orlando, and looks like tons of fun at the movies as well! Are you ready?